Jean Louise returns to Maycomb County after living for years in New York. Her father Atticus is now in his 70s, and she is courted by her childhood friend Henry. Jean Louise is still rambunctious and independent, but it looks like her family has changed. One day she finds evidence that her father and uncle have been attending the Maycomb County citizen’s council. Atticus speaks out against the recent Supreme Court ruling outlawing segregation. He only defended that black boy for professional reasons. The Supreme Court overstepped its boundaries. Atticus must continue to defend black people, otherwise the NAACP will. Jean Louise is horrified. Her father had been her role model, but she had been deceived. He had deceived her. How can she ever love her father again? 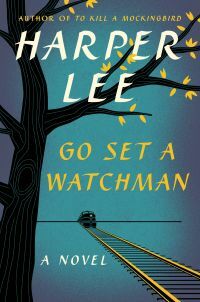 Go Set a Watchman is Harper Lee’s controversial sequel to To Kill a Mockingbird. For the first time, Jean Louise (and the reader) has to face the unpleasant truth about the character of a beloved lawyer and father. I put off reading this book for a long time because of all the controversy surrounding the publishing of Go Set a Watchman. I also admired Atticus Finch like so many other Americans. But in the past year, I have become increasingly interested in the dark side of humanity (evil, prejudice, and guilt). I knew that I needed to read GSAW. Even though it was very poorly edited (I believe it was only a first draft), GSAW will probably be one of my favorite books of 2017. This is the only book that I have ever read that explores prejudice from the white perspective. Growing up, I was taught that racism was something that existed 50 years ago, but is no longer an institutional problem in America. We were so wrong. Like Jean Louise, we thought of Atticus as the exception to the rule – the white savior who represented the “good” white man. Unfortunately, this image of Atticus has prevented us from having a serious discussion about prejudice. GSAW is so hard to read because it is clear that Atticus is not an entirely bad person. As long as we assume that only “bad” people are capable of prejudice, institutional prejudice will continue to exist in America. Atticus is an educated man. He justifies his prejudice with reasoned argumentation. Prejudice is so hard to combat because the person who is prejudiced thinks his/her beliefs are reasonable. The “white trash” image of prejudice is so convenient because it allows the rest of us to wash our hands of the problem. As long as we pretend that only “uneducated” people are capable of prejudice, we will keep pretending that America is colorblind, and people of color will continue to face oppression. Jean Louise might think she is innocent, but a closer look at her character reveals that she too is guilty of racism. I may not be white, but facing my own personal prejudices in the past year has been one of the most difficult things I’ve ever done. For very personal reasons, I am so glad I read GSAW. In general, I strongly believe that TKAM and GSAW should be read together. While washing dishes one day, twelve-year-old September is suddenly whisked away from her home in Omaha, Nebraska to Fairyland by the Green Wind and the Leopard of Little Breezes. She befriends a wyvern named A-Through-L, saves a marid named Saturday, and goes on a mission to retrieve a sword for the Marquess, who is the dictator of Fairyland. September struggles to understand Fairyland, remember the Green Wind’s rules, and escape from the traps set by the Marquess. The Girl Who Circumnavigated Fairyland in a Ship of Her Own Making by Catherynne M. Valente is the first book of the Fairyland series, which ended this year. It is an adventure in the tradition of Alice in Wonderland, The Neverending Story, and The Wizard of Oz. September goes on a quest to save her friends from the Marquess even though she’d rather return home to her mother. This is a strange book. The creatures are odd and the rules of Fairyland are so unlike those of our world. I found it hard at times to follow the action and remember the prohibitions. The Green Wind gives September a list of prohibitions at the beginning of the adventure, but I must admit that I forgot them immediately after they were named. Still, the story was straightforward enough that a middle-schooler could reasonably follow it. I liked how it was hard for September to categorize the creatures she met. A-Through-L looks like a dragon, but he believes he is half-library (!). Saturday looks like a fairy, but he only grants wishes if he is forced into submission. We, like September, have to learn about Fairyland mostly from scratch. Our expectations are constantly called into question. The characters are multi-dimensional; nothing is black or white. It looks like the Fairyland series will break common fairy-tale tropes. I do worry though about the direction the story is taking. I was not fully satisfied with the twist at the end of the first book. The Girl Who Circumnavigated Fairyland in a Ship of Her Own Making is not the first fairy-tale adventure ever written. I have read plenty. Some I’ve loved (such as The Neverending Story, The Little Prince, and Gulliver’s Travels) and some I’ve not liked as much (such as The Wizard of Oz and Alice in Wonderland). Late medieval religious and secular literature has also exposed me to quite a lot of allegory, so if an author employs allegory it better be good. I have very high expectations. I was not disappointed by the first book in the Fairyland series, but it didn’t wow me. It is simply too soon for me to tell whether I will love the series or not. I may need to reread the first book before continuing because (as I indicated) I forgot a lot of details. Billie Joe is growing up during the Depression and Dust Bowl period of the 30s in Oklahoma. Her mother has died, she suffers from horrible burns on her hands, and she can no longer relate to her father. In a series of poems written in blank verse Billie Joe describes her hobbies, family, and schooling from 1934 through 1935. 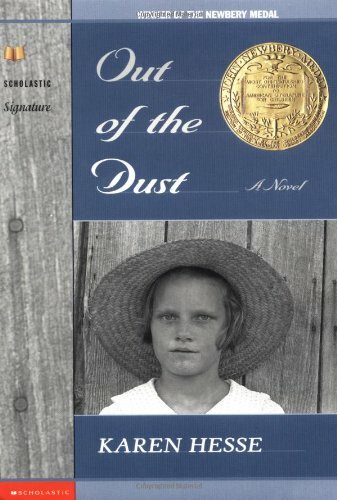 Out of the Dust by Karen Hesse won the Newbery Medal in 1998. It seems to me that the Association for Library Service to Children likes to award Newbery Medals to really depressing books written for middle grade students. Out of the Dust is one of those books. If it had not been written in blank verse the book would have been unsuitable for children. The subject matter is just too tragic. However, this work is a good introduction for children to an important period in American history. Because it is written in verse, middle grade students should not be too disturbed by the content. My only major criticism is that the narrative style did not really add much to the story. While a few poems left an impression on me, most of them weren’t very memorable. What Billie Joe was trying to communicate could have been communicated just as effectively if not more effectively in prose. All in all, it was a pretty underwhelming read. I don’t know what other children’s books were published in 1997, but I didn’t think Out of the Dust was as good as some of the other award winners. A real dog named Rover is transformed into a toy by a wizard he offended. Two boys play with the toy until Rover manages to get away through the help of the sand-sorcerer Psamathos Psamathides. Rover (later renamed Roverandom) meets the Man-in-the-Moon, flies on the back of a seagull, and encounters a ferocious dragon all while searching for the wizard who transformed him into a toy. Roverandom by J.R.R. Tolkien is a fantastical adventure riddled with wordplay and literary references. Although Tolkien wrote Roverandom for his four-year-old son Michael, it was published after Tolkien’s death. Tolkien’s writing never ceases to impress me. He has a great mastery of the English language and creates such odd creatures. None of these elements were lacking in this book. However, it was very obvious to me that Roverandom was an unfinished, unedited work. At times, it was hard for me to follow Roverandom’s adventures. None of the characters were developed and there was no rhyme or reason to the magic in the book. It was quite a forgettable story. The illustrations were beautiful, but they were stuck in the middle of the book, so I didn’t always know what scenes they were supposed to depict. I also wish the editor had used footnotes instead of end-notes. I didn’t realize there were notes to the text until after I finished the story. 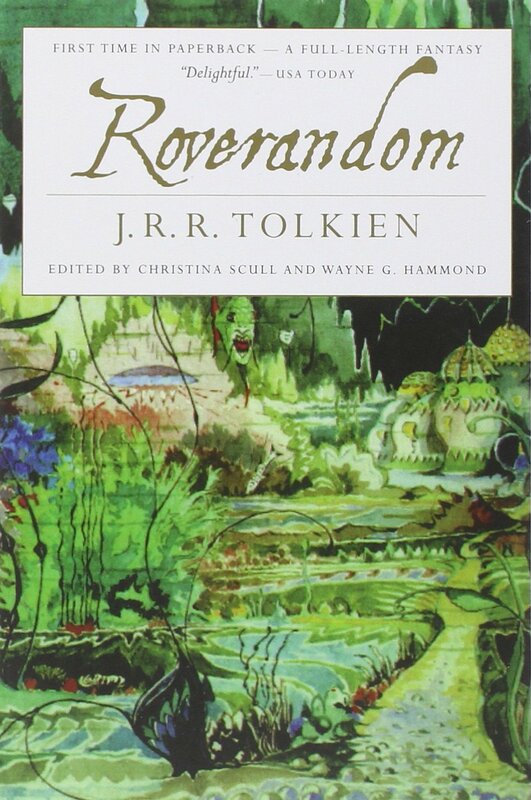 If you are a Tolkien completionist then by all means read Roverandom. I am glad that I read it, but it definitely left much to be desired. Milo is bored. He is no longer interested in the toys and books he owns. Suddenly, he notices a package in the corner of his room. As it is neither Christmas nor his birthday, Milo doesn’t know what the package is for, but he is curious to unwrap it. The package contains a turnpike tollbooth with instructions for constructing it. It also includes highway signs and coins for paying tolls. Milo gets inside a toy car, drives up to the tollbooth, and is transported to a world in which words are food, watchdogs keep time, and numbers are mined but real gems discarded. In this Kingdom of Wisdom, two brothers (King Azaz the unabridged and the Mathemagician) live on opposite sides of the kingdom because of their rivalry over whether words or numbers are more important. Unfortunately, the rivalry led to the banishment of their adopted sisters Princesses Rhyme and Reason to the Castle in the Air. With King Azaz’s support, Milo, the watchdog Tock, and a prideful insect named Humbug set off for the Castle in the Air to rescue Princesses Rhyme and Reason and bring peace and harmony back to the Kingdom of Wisdom. 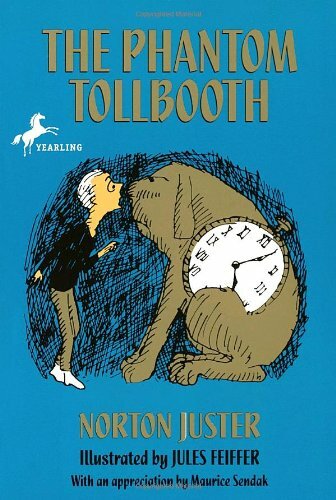 The Phantom Tollbooth by Norton Juster is replete with wordplay, metaphors, and common expressions. I personally enjoy didactic tales for children wrapped up as fables/fantasy stories. The Phantom Tollbooth is of this tradition. It is witty, and insightful. Children can enjoy meeting the wacky monsters, and teenagers and adults can pick up on all the clever wordplay. Parts reminded me of La Grammaire est une Chanson Douce (Grammar is a Sweet, Gentle Song) by Erik Orsenna, which I read for one of my French classes last semester. Parts also reminded me of Alice’s Adventures in Wonderland and the Disney film Donald Duck in Mathmagic Land. The illustrations by Jules Feiffer brought the story to life. They were an essential component of the story because they helped me imagine the creatures in the Kingdom of Wisdom. I highly recommend The Phantom Tollbooth.